Atop a cursed mountain, in towers of ice and snow, is a danger of primordial origin - the Lord of Frost. From his frozen keep, he threatens the lands and peoples in the shadow of his mountain, bringing low all who come too near. Winter comes early as snows billow from the keep and blankets the fields and villages near the mountain's foot. Help is needed to break the hold the Lord of Frost has over this land and end his reign before his powers reach well beyond the mountain. The weathered mountainside presents great challenges as blasts of ice and cold pummel the weak, and giants lob rocks and icy boulders at interlopers. This is little compared to the dangers awaiting those who dare cross the threshold into the Frozen Keep. Its frozen halls and icy heights hold elemental powers which care nothing for the needs of man nor beast, and only within the bowels of this terrifying fortress is the key to lock winter in its palace. 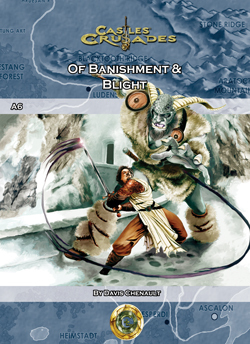 From the makers of the Castles & Crusades role playing game comes the sixth adventure for champions and heroes to ascend icy heights and bring an early winter to an end.